In higher education, I believe the most important audience to influence when launching a brand is the internal audience; more specifically faculty and staff. I liken it to a popular saying (although slightly modified), “Keep your friends close and your critics closer.” I believe the culture of an academic institution requires even greater attention to branding strategies internally prior to any external launch. In academia, it is encouraged to challenge theory, practice, and concepts. It’s a kind of safe place where voicing personal opinions are encouraged much more beyond what I believe you would find in any commercial industry. I just don’t see a factory line manager emailing the company CEO criticizing the company branding campaign. Please share with me if I’m wrong here. But, this happens in higher education. Successful adoption of a brand internally requires dedicated attention by the marketing and leadership team. Let’s be fair, with almost any new idea or concept, we have those that are on-board. We have those in the middle who seek rationale and edcuation for them to buy-in. And finally, we have those who will always find fault regardless of fail-safe rationale. They cannot be wooed. Nevertheless, we can’t assume that the middle group will become any level of brand ambassador without appropriate attention. Moreover, effective buy-in may take time and therefore cannot be obtained with a single-moment experience. It must be a campaign. It must be an important strategic initiative to a brand launch in higher education, equally if not more critical than the external launch. Last November, Doane College launched our new brand, the “College of” Campaign. We began with an event to introduce the brand concept and educate the internal community on how it came to be. We made our case and asked the campus community to partner with us to help build the brand. This event was just the beginning. As we launched the external campaign, we continued to build the brand internally with social media, email signatures for the new brand, t-shirts, approved slogans, and also campus signage. Although I’m not satisfied that we’ve gone far enough to this point, I do acknowledge that we are making progress. Having said that, some of our critics will share concern for higher education becoming too commercialized. My response; Absolutely! 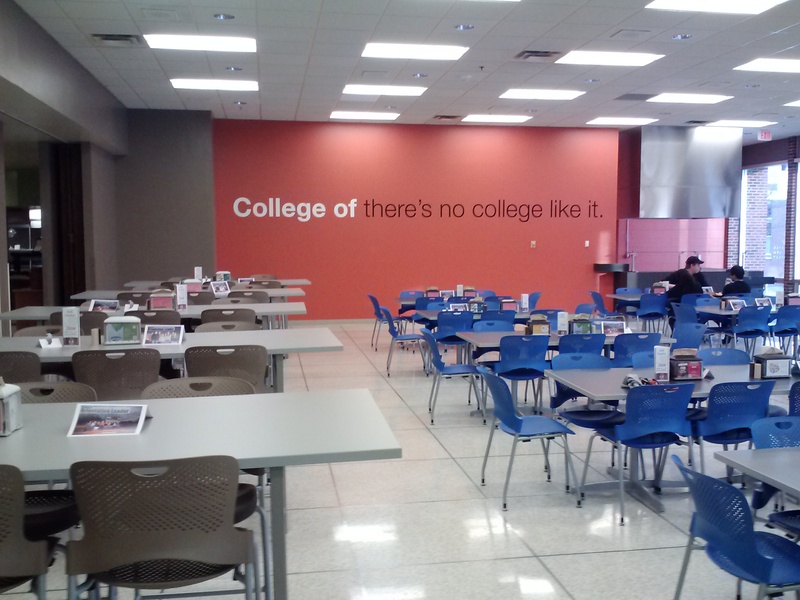 A singular example (albeit relatively small in scale) epitomizing the culture change that we are trying to encourage at our historically conservative Midwest college is the addition of a large brand slogan on a bright orange wall in our renovated cafeteria. This replaced a very nice mural that had been there for some time. I have no doubt that this created consternation with some campus community members. But, it also caught their attention and it will catch other’s attention. Our approach to this brand is not guided by conservatism or being safe. Rather, we are interested in taking more of a bold approach in order to capture the attention of those that currently are not seeing us or hearing our message. We cannot expect to reap the rewards of a strong brand that is sheltered and saved only for billboards and radio advertising. A brand provides an opportunity for personal reflection and ownership. A brand, particularly in colleges and universities, evokes a very strong sense of pride. High Point University: An example of a strong internal brand. I had a great opportunity this last spring to visit High Point University (HPU) in High Point, North Carolina. HPU is a perfect example of a university that embraced a brand and leverages that brand to the fullest extent. HPU has undergone an incredible transformation in the last 5-10 years. The purpose of our visit was to engage Dr. Nido Qubein, HPU President, in a conversation about growth and their incredible success transforming a struggling college to a thriving university in a short period of time. A little research will tell you quite a bit about their transformation. It required and continues to require substantial financial investments in their core business to be better and better. And, while I was interested in learning much on my half-day campus visit, I did not expect to leave with such an incredible first impression that was the incredible result of their brand. HPU embraced a branding campaign on steroids which included significant investment in on-campus branding. Everywhere you were on campus, it was clear that you were a HPU community member. The feeling of belonging was tough to ignore as a result of signage and other unique attributes. This got me thinking. I believe HPU did a tremendous job creating an internal culture of excitement and pride. And, it wasn’t about athletic pride! Instead, they took their mission and created an opportunity to brand themselves internally…basically selling a dream to their students, faculty, and staff. They inspire the campus to “Be Extraordinary”. On just about every door on campus you will find ‘Be Extraordinary”. Walk into the cafeteria, you will find large banners, “Be Extraordinary”. The campus is branded with their colors of purple, black, and white. It is impossible to leave the campus without easily understanding what they stand for. They’ve made it simple. I’m on a mission with our Strategic Communications Team to brand Doane’s campus with aggressive vitality over the course of the next two years. I want this to be a place where it’s impossible to not feel the incredible pride and confidence in our mission and purpose. I want our campus to be the place where prospective students step onto campus and get goose bumps. I want faculty and staff to walk across campus and read and see visual symbols of what makes this a special place. Wherever you are on campus, I want it to be obvious you are on Doane’s campus. You are a Doane Tiger, or you wish you were.